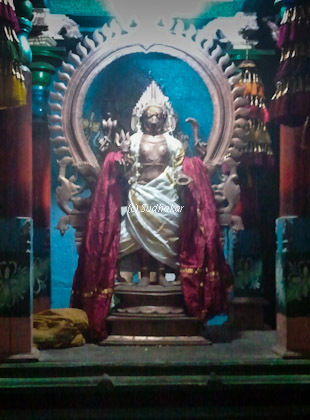 The history of the temple dates back to more than 1200 years. 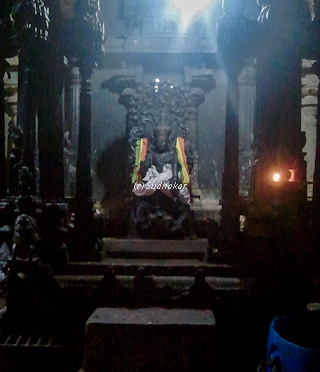 The legend behind the temple goes like this - Kashyaba munivar's son Sooran did a severe penance towards Siva and he was granted a wish that no one can destroy him other than Siva himself. Riding on the glory of his invicibility he was torturing and killing the Devas.Indiran went to their leader Brahaspathi. Brahaspathi said that only Siva can solve this. Indiran went to lord Siva. Siva took the avathar as Bairavar (Vairavar in Tamil) and destroyed Sooran. He then appeared as a celestial light (Peroli). He is The one presiding here as 'Valaroli Nathar'. Vairavar appears here as Raja Marthanda Bairavar with dog as his vahana in a sannithi between Siva and Vadivudai ambal. The beautiful Ambal Vadivudayamman face south. There are two lizard relief statues behind the Goddess. Praying to these lizards is supposed to remove all doshas. 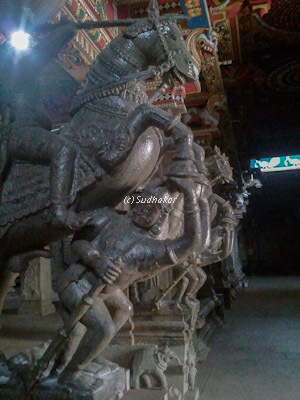 As you come around the praharam, you can see beautiful carvings and statues. 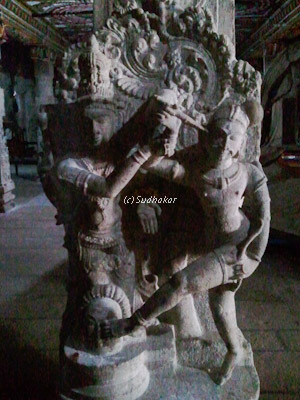 The artistic soldier and the horse statue is a sight to watch and so is the tale of Kannappa Nainar carved out of a single stone. 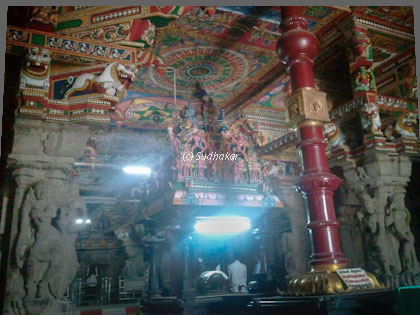 There is a sannidhi for Dakshniamurthy who majestically sits inside a seven pillared mandap. These pillars are musical pillars denoting the seven raghas. The paintings on the roof are breathtaking depicting stories from the puranas. During Karthikai ( Nov-Dec) Sambaha soora sashti and Karthikai Deepam festival are celeberated. Mahasivarathiri in the Krishna Paksha every year on the month of Masi or Phalguna. How to reach? The nearest airport is Trichy. Rail head Karaikkudi is a major station with trains from Chennai, Trichy, Madurai. 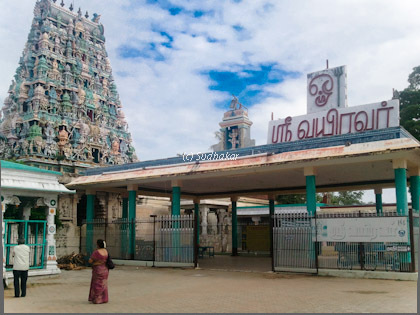 From Karaikkudi , buses, taxis are available to reach this place.